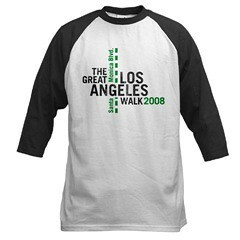 The response has been great so far -- I'm expecting the biggest turn out yet for our third annual Great Los Angeles Walk. There's still plenty of time to join in -- just email us to let us know you're coming! To answer the two most frequently asked questions: Is it free? Of course. And is this a fundraiser of some sorts? Nope. The only cause here is "just 'cause." We walk because we love Los Angeles, and there's no better way to see the city up close than on foot, along with other fellow Angelenos. -- Time's running out to order a shirt, if you want to wear it during the walk. According to Cafe Press, it takes 7-9 business days for the shirts to arrive via the cheapest shipping method. Check out our Franklin Avenue Cafe Press store to order. Again, we don't make any money off these; as a matter of fact, we're doing this through Cafe Press so that we don't have to deal with money, period. -- Our Facebook event page is up. Feel free to head over there and join the list. -- We're taking recommendations (or even better, looking for eateries that might be willing to partner with us) on where to hold the after party in Santa Monica, and where to gather for lunch in West Hollywood. Suggestions? Email or comment below. It's official: For our third annual Great Los Angeles Walk, we'll be pounding the pavement from Union Station to the ocean. All told, that's 18.3 miles -- including portions of Cesar Chavez and Sunset, before marching down Santa Monica Blvd. in its entirety. 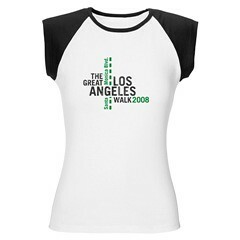 In 2006, we walked the length of Wilshire Boulevard. Last year, we walked -- and ate -- our way through Pico Boulevard. This time out, we're sticking with our downtown-to-the-ocean theme (that ocean breeze helps pick us up in the afternoon as we inch closer to the water), and sticking with the Saturday before Thanksgiving (there's something about walking this much a few days before stuffing your face that makes you feel better about that Thanksgiving gluttony). This time out, Sunset and Santa Monica promise plenty of interesting sights -- and we'll even hop off the path once or twice to check out sights like the Angelino Heights Victorians. Santa Monica Blvd. also cuts through four cities -- L.A., West Hollywood, Beverly Hills (then L.A. again) and Santa Monica. Above, in a pic from Will Campbell, Great Los Angeles Walkers kick things off at the start of the 2007 walk. 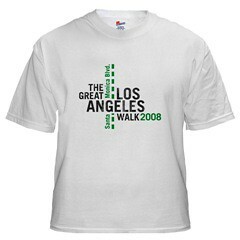 Meanwhile, we've already got several different Great Los Angeles Walk 2008 shirts ready for purchase via Cafe Press. (We don't make a dime on these, we only uploaded the image just in case you wanna show off your feat.) Check out our Franklin Avenue shop here. You've got a week or so to order if you want to wear the shirt to the walk.